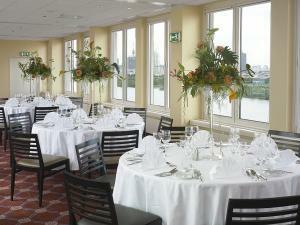 Soak up stunning views of the River Danube from the Hilton Vienna Danube hotel, the only waterfront hotel in the city. The hotel is just 20 minutes’ drive from Vienna International Airport, take the new U2 underground train direct into 7 minutes to the city centre. There are 12 flexible meeting rooms for 10-300, a business centre and wireless internet access in all public spaces.Unwind riverside at the outdoor pool or just take in the view from the terrace of the elegant Symphony Restaurant.Stay onsite and enjoy the Active Club, and round off your day in the low lighting and dark-wood decor of the Rhapsody Lounge Bar.All Hilton Guest Rooms have wireless internet access and a separate working area. Step up to a Deluxe Room for a river view.